A newly passed bill in Virginia has introduced changes to the bonding requirement for gas and oil operations permit applicants. The bill changes the surety bond required for different numbers of wells. The new bond amounts vary from $25,000 to $200,000, whereas previously the maximum amount was $100,000. Here’s an overview of the bill’s provisions. Usually, applicants for a gas or oil operations permit in Virginia need to post a separate bond for every permit they apply for. For individual wells, applicants need to post a bond in a minimum amount of $10,000, along with an additional $2,000 for each acre of disturbed land, calculated to the nearest tenth of an acre. When individuals apply for numerous permits they may, instead, be required to post a so-called blanket bond covering all of them. In addition, the bill also introduces the possibility of an additional bond or financial security being required by the Director of the Division of Gas and Oil from applicants who want to drill in Tidewater Virginia. What is the Purpose of the Gas and Oil Permit Bond? 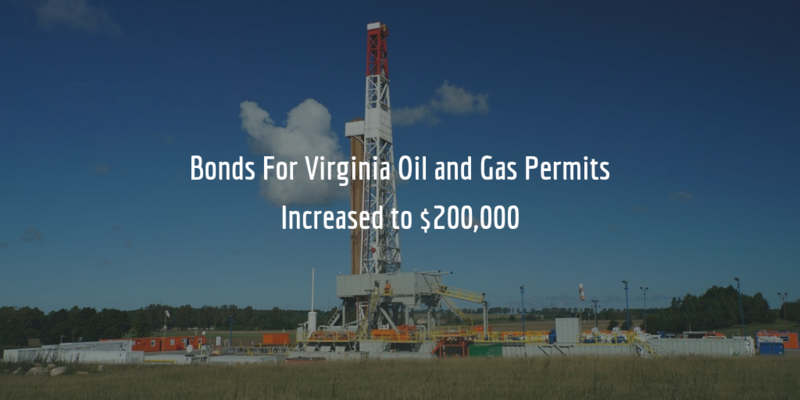 The bond required by gas and oil operations permit applicants in Virginia is required to ensure permittees’ compliance with The Virginia Gas and Oil Act, and all other rules that apply to their operations. In particular, the bond serves as a financial guarantee that the costs of properly plugging a well and restoring the site after its exploitation will be covered. Get a free quote on your oil and gas surety bond by completing our simple bond form. We’ll get in touch with you shortly to provide you with your quote and more information about getting bonded.